Even in this digital age, it is impossible to homeschool without books. Books. Books. I am surrounded by books. In fact, there are days when I think I could qualify for an episode of Hoarders simply because of the books in my house. 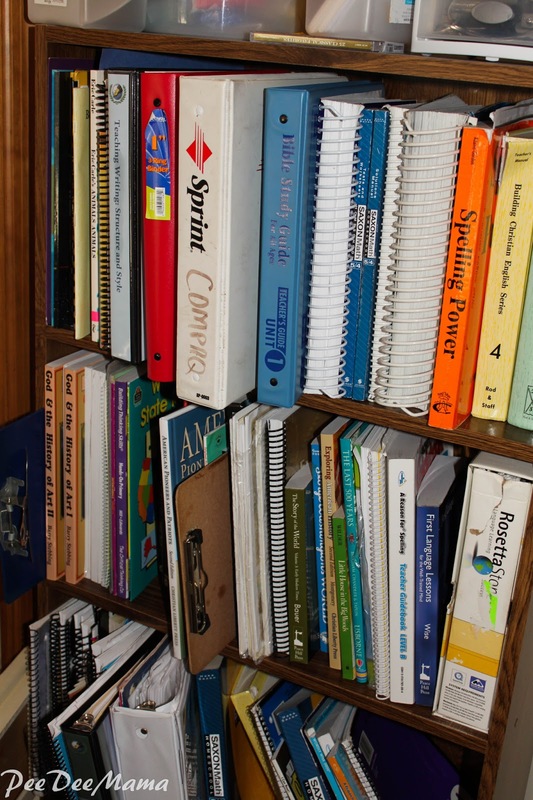 We have textbooks for grammar, math, and science. 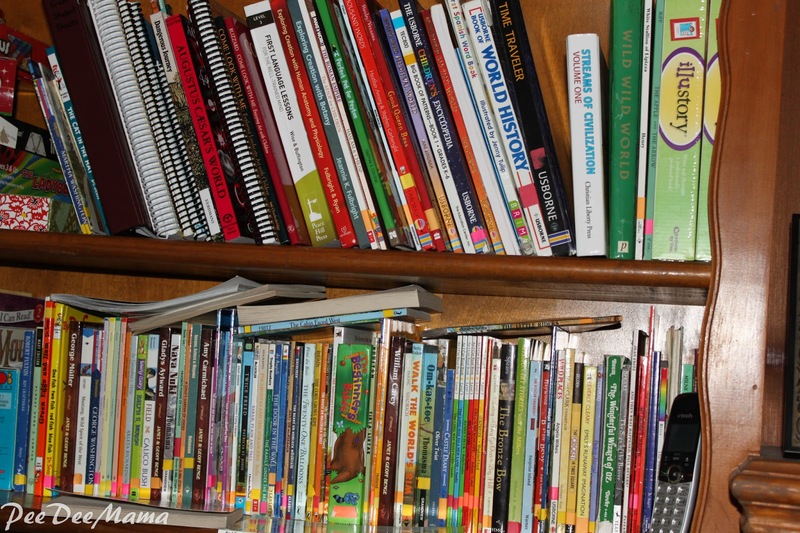 For history, though, we use a variety of books: children's encyclopedias, biographies, living books, historical fiction. There are so many good books out there to help teach a multitude of concepts. One reason I am surrounded by books is that I keep books from each year to use with the younger ones when they get to that level. Now that The Boy is in 7th grade, I have books from kindergarten to 7th grade. It does have its benefits. Each year, I only have to purchase books for The Boy, along with some consumables for the younger ones. Another reason I'm surrounded by books is that Ballerina is a bookworm. I can't keep her in books. She reads at least 1 chapter book a day. Thankfully, we have a very good library. I mentioned the library. It's such an incredible resource. Since the money tree in my backyard hasn't yet produced a crop, I couldn't possibly afford all of the wonderful books on any given subject we might be studying. Our library gives me the ability to reserve books online from the comfort of my home; then all I have to do is stop by the library and pick them up. It's perfect for a busy mama! Hi,Thanks for visiting my blog.You homeschool? Brave lady! I love books and now have huge books shelves.I've started a collection for my granddaughter who's 20mths. My favourite book changes all the time.For the past few years it has been The Island by Victoria Hislop.In childhood it was The Secret Seven books by Enid Blyton. I haven't read either of those books. I'll need to check those out! I can't pick a favorite book. There are too many! If you're going to hoard anything, make it books. They are so useful and it's great to surround children with them. They can learn so much just by reading books they enjoy. My daughter is a major reader too. Let me know if you get the money tree thing to work. I'd love some gardening tips on that. 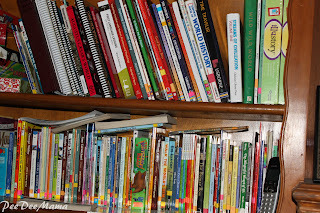 We have more books in our house than we have air! There are so many unread ones, but we couldn't be without them! I think my favourite all time book is Brave New World by Aldous Huxley, or Matilda by Roald Dahl. I think I'm with you on not being able to be without books. Ooh, I love the pictures of your books :) Books just make me so happy! I have a Nook now, which I absolutely love, but I will never get rid of my book collection. I'm with you. I have a Kindle, but it can never replace the feel of a real book in my hands. I'm a huge book lover! My house is crammed with books. I'm so glad my son is a reader too! Isn't it great when our children are readers? As cluttered with books as we might be, I wouldn't change it. Thanks for calling in on my blog on the A-Z hop, btw! I'm hoping I don't have to move again until my last child has finished homeschooling. I can't imagine trying to move all of our books. I love our library and though it is quite small, it's very easy to go online and order the books you want and they get brought from another library and an email sent to you when they're ready for collection. The problem is, there is never enough time to read all the books I want to read. Especially this month! I'll be lucky to get any reading done! I don't think I'll ever read all of the books I want to read! It is very convenient and a wonderful service that they offer. I am so with you on the book hoarding! When I first started my blog, I wrote about being a bookaholic. I love books. Unfortunately, I don't have a lot of time to read books for pleasure. But, they're there for whenever I get the time!!! I used to buy books for the kids on ebay and I have a ton from garage sales. I actually need to go through and donate some, which makes me extremely anxious!! Thanks for stopping by Fit, Fun and Fashionable after Forty! 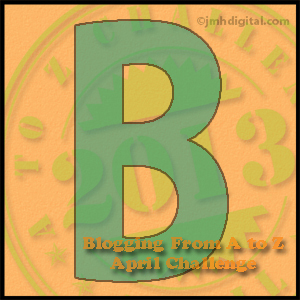 Good Luck and have fun during the A to Z challenge! I understand about feeling anxious about going through your books to donate. I need to get rid of some at the end of this school year, and I feel like I'm cutting off an arm or something! I love books too! We have tons here.